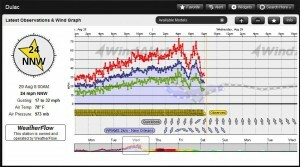 WeatherFlow has decades of experience creating custom applications to meet a variety of client needs. In 2005 through a contract with the US Navy, WeatherFlow created a unique data viewer that we called Data Center. The professional viewer has become widely used by many partners and clients as a powerful heads up display for current conditions, warnings, and alerts. In 2012, WeatherFlow upgraded our DataCenter to become DataScope driven by WeatherFlow’s weather engine enabling a ton of new features and limitless flexibility to adapt to client needs. What can WeatherFlow do for you?